This Palmerbet promo code review will provide a full overview of the best features Palmerbet offers for new customers. Palmerbet was established in 2013 and is one of the newer Australian bookmakers. They currently offer one of the largest bonus bets in the industry for new customers and we’ll provide a comprehensive review of their best features including the Palmerbet sign up bonus. As a new customer, you’re eligible for a Palmerbet promo code during the registration process. Continue reading for a step by step guide of the registration process. What can I get with the Palmerbet promo code? First step is to click on the button below this list. Then on the link provided, click claim bonus bet and enter your registration details along with the promo code. Once you meet the qualifying criteria, you’ll receive a welcome email and instructions for verifying your account or how to deposit. You can now login to your Palmerbet account and bet with the bonus bet. The Palmerbet all sports bonus of 100% up to $250 rounds out the promotions offered by the operator. To redeem this first deposit bonus, simply sign up, make your first deposit, and have it matched dollar for dollar up to $250. After which, you can use your bonus funds on all sports at Palmerbet. Can’t be claimed in conjunction with other offers. Excludes NSW, VIC, SA and WA residents. Palmerbet have you covered with a range of markets for both sports and racing. They provide competitive odds for all sports and racing. On the desktop website, all sport categories can be accessed and all racing types. For racing, you’ll find the next 5 upcoming races for easy navigation. In the quick links section, you’ll find the most popular racing and sports events to bet on. They also have future markets available for the main sports in Australia and Internationally. For Australian Rules Football, they’re lacking future markets for AFL Grand Final winner and the Coleman Medal. However, they have markets for the Brownlow medal and lower leagues (VFL, SANFL etc). Whereas, they do provide a Grand Final future market for Rugby League, as well as lower leagues (NSW Cup, QLD Cup). For overseas sports, they have future markets available for World Series Winner (Baseball), NBA Championship (Basketball) and Super Bowl Winner (NFL). They also have 15 NFL future markets and you can bet on divisional winners, rookie of the year and more well before the season starts. Quick Multis is Palmerbet’s multi builder feature that has become a norm in the Australian betting industry. A quick multi automatically selects all the favourites in a sport and you can simply add a betting stake to bet on this multi. The quick multi can be changed before the bet is placed. When we look at an upcoming AFL match for an odds comparison between three other Australian bookmakers, Palmerbet provides competitive odds for the favourite at just 1 cent lower than Sportsbet. William Hill and Crownbet provide better odds for the underdog, but that’s mainly because Crownbet is affiliated with the AFL and William Hill give the lowest odds for the favourite. In terms of sports promotions, Palmerbet offer weekly specials for the most popular, upcoming sports events. For example during the AFL and NRL season, they’ll offer money back specials on Friday night football. They’ll also promote the A-League, State of Origin, Cricket World Cup and all major sport events in Australia and Overseas. The racing promotions range from a bonus bet for a runner finishing second and specific bonus bets for racing. They mainly focus on Horse Racing and Greyhounds for promotions. Live bets can be accessed from the quick links menu on the desktop website. This page will show all live sports betting events that Palmerbet offers. 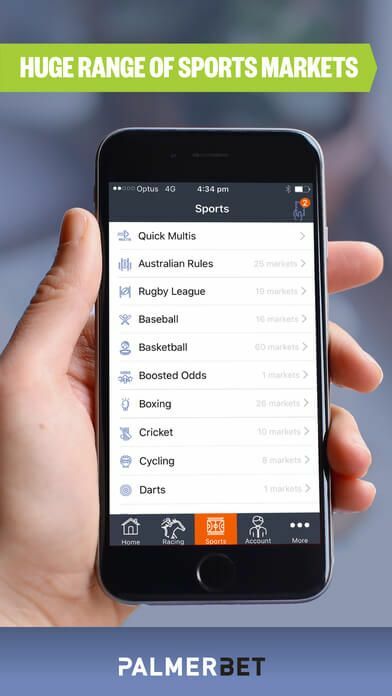 Live betting is required by a phone call in Australia and Palmerbet complies with this law. The minimum amount for a phone bet is $10. At the time of writing this review, Palmerbet don’t provide any live steaming options. They face competition from the likes of Sportsbet and William Hill in this category. 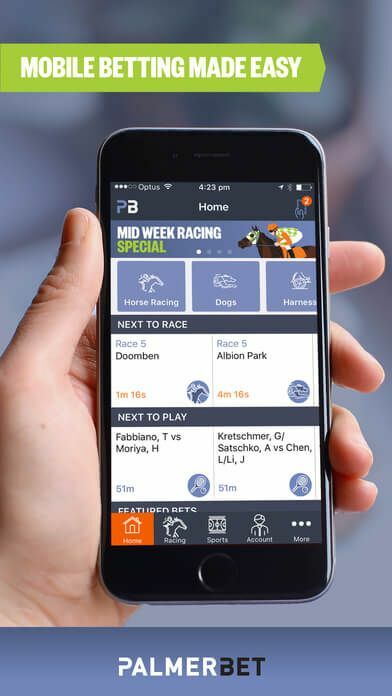 Palmerbet have a mobile app available on both Apple and Android devices. They launched their Android App in 2017. 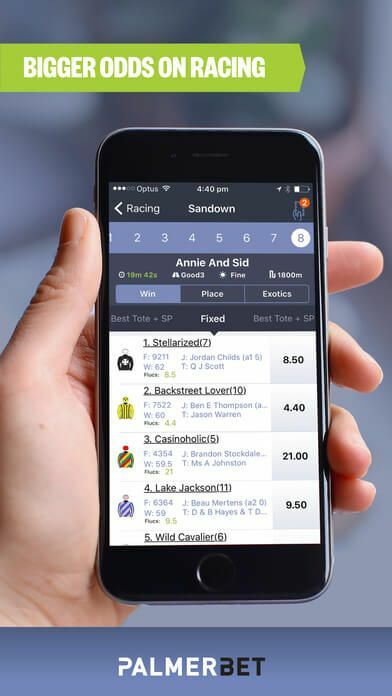 On the mobile app, you’re able to: view transactions, deposit funds, withdraw funds, edit account details, view betting activity, change password and redeem a Palmerbet promo code. In terms of design, the homepage of the app displays their latest promotions, featured categories, next to race, next to play and featured bets. The betslip is located in the top right and it can be selected on all pages. Adding a multi-bet is a two-step process as you need to select the create multi button at the bottom of the betslip. Then you select all the single bets and enter a betting stake in the final step. In the sports betting section, popular sports include a handy category dropdown for different betting types. For example, AFL has the following: Win, Line, Draw, 1-39, 40+ and Over/Under. This saves the user from selecting each match individually for the same bet, instead you can quickly create a multi from the one screen. 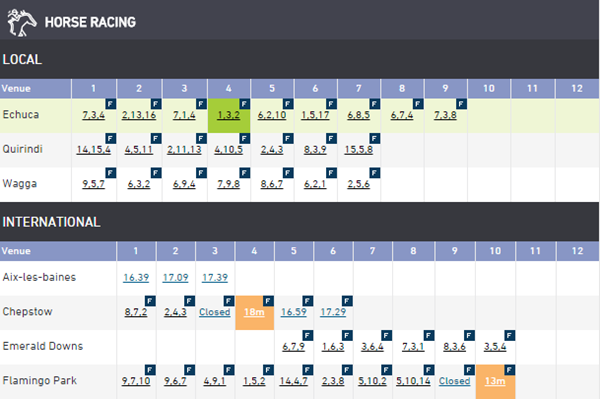 For racing punters, the app provides an in-depth form-guide for Group 1 racing, which is a great feature. The deposit options available through the app are: Credit Card, POLi, BPAY and Bank Transfer. The Credit Card and POLi options provide instant funding. A BPAY deposit will take up to 2 days to clear. While a Bank Transfer will clear the next business day. BPAY: 1-2 business days and only available for Australian bank accounts. Bank Transfer: 1-2 business days. They’re missing a few payment options such as PayPal and eWallet (Skrill, Neteller), hopefully they add these options soon. Before a withdrawal is made, you must verify your Palmerbet account first and your credit card. To verify your account, visit the my account and select verify. You’ll be required to send through an ID document stating your name and address to confirm your account. For credit card verification, they’ll bill an extra amount to your card after the initial deposit which is needed for this process. The next step is to login to your bank account and find the transaction. Then in the Palmerbet my account section, select verify card and enter the verified cents amount. Once your account is verified, a withdrawal can be made into your nominated bank account. The withdrawal will take 2-5 business days to clear into your bank account. Palmerbet is online, Monday to Saturday from 8am to 6pm on each day. They provide two phone numbers, one for support and the other for phone betting. Otherwise, they can be reached by email or post. They currently don’t provide a live chat option. In comparison with Australian bookmakers, Palmerbet are behind in this area as most provide a live chat service. They also don’t provide support on Sunday and late at night. However, they fall short in many categories – such as live streaming and cashout, compared to other Australian bookmakers. They don’t have a PayPal depositing option and they lack a live chat service. They’re also missing future markets for popular sports events such as the AFL Grand Final. Overall, the Palmerbet promo code is a great starting point for new customers that have tried Sportsbet or William Hill (to name a few) and looking for a new bookmaker. 1.Is there a Palmerbet Promo Code currently available? Palmerbet currently provide two bonus bet offers, the first promo code is a $250 bonus bet and they’ll match your deposit up to $250. All Palmerbet bonus bets have a turnover requirement of odds $1.80 or greater. The Palmerbet promo code is currently only available for residents in Australian Capital Territory, Northern Territory, Queensland and Tasmania. It excludes customers in New South Wales, Victoria, South Australia and Western Australia. They don’t provide a specific mobile bonus bet. But you can still get the Palmerbet sign up bonus by entering the promo code after registering for a new account through the mobile app. Each bonus bet offer can’t be used with existing offers. 5. I can’t seem to obtain the Palmerbet sign up bonus, what should I do? In this case it’s best to contact Palmerbet with your request and the support team will get back to you with a resolution.